Doo Town, another unique facet of Eaglehawk Neck, is a small but very distinct part of the township. It comprises just thirty to forty houses, nestled between the sand dunes behind Pirates Bay (Descent Beach), a privately owned deer and cattle farm and the Tasman National Park. There is literally no room for it to grow any larger. 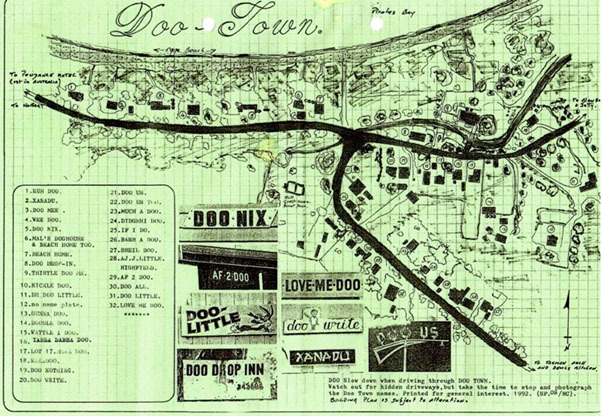 Over several years nearly every property owner in the area gave their ‘shack*’ a ‘Doo’ name and eventually the Tasmanian Nomenclature Board approved Doo Town as the official name of the ‘town’. Doo Town now enjoys an international reputation, having featured on many travel shows and in travel publications. There are more than 30 names to be found – see how many you can list?